In To Die a Stranger, Jilly Paddock introduced readers to the rather unique and dangerous world of Anna-Marie Delany and Zenni. Pro Se Productions proudly announces the release of Paddock’s second novel in this action packed and innovative series. With Amber Tears is now available in print and digital format. The time is the 26th century and the world has just about recovered from the Dark, an ecological and political catastrophe that brought humanity to the brink of extinction. Life is good now on Earth and the core planets of her trade empire, but it’s not as easy or comfortable in the poorer colonies. The Mother-world preserves her dominance by means of covert manipulation and elimination of her enemies, that being the remit of Earth Intelligence. EI have a secret weapon, a small group of agents who can read minds, move objects without touching them and walk through walls, tricks worked not by magic but by pairing ordinary people with computers that give them access to psionics. While investigating a devastating aircar crash that almost killed her, Anna-Marie Delany stumbled into EI’s operations and became a spy by mistake. She combined with Zenith Alpha 4013 and had to steal him. They fled Earth and are still on the run. EI want Zenni back and Anna dead, and set a trap for the novice agent-pair on the desert planet of Lysseya. Lysseya is a name Anna knows from the pulp novels and trashy sci-fi romances of her youth, a world rumoured to be full of treasure and riches guarded by a race of night-black warriors, all of them telepaths. She and Zenni feel safe enough there, protected by their newly-gained psi powers, but can they survive when EI’s trap is sprung under the hell of Lysseya’s triple suns in the desolate black desert? With Amber Tears- The second volume in Jilly Paddock's epic space opera, Zenith Alpha 4013. From Pro Se Productions. 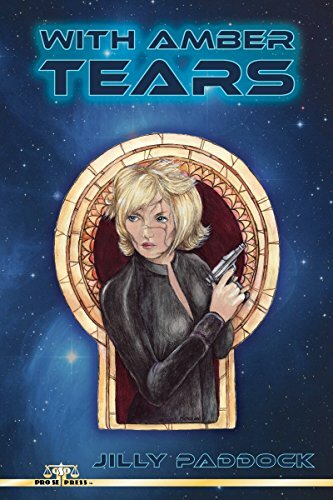 Featuring an evocative cover by Morgan Fitzsimons and print formatting and cover design by Forrest Bryant, With Amber Tears is available now at Amazon at http://www.amazon.com/Amber-Tears-Jilly-Paddock/dp/151961702X/ref=sr_1_2?ie=UTF8&qid=1449157344&sr=8-2&keywords=with+amber+tears+jilly+paddock and Pro Se’s own store at www.prose-press.com for 15.00. The sequel to To Die A Stranger is also available as an Ebook, designed and formatted by Bryant and available for only $2.99 for the Kindle at http://www.amazon.com/Amber-Tears-Jilly-Paddock-ebook/dp/B018W37GYO/ref=sr_1_1?ie=UTF8&qid=1449159439&sr=8-1&keywords=with+amber+tears+jilly+paddock and for most digital formats via Smashwords at https://www.smashwords.com/books/view/597724. FRANK SCHILDINER’S ANTHOLOGY OF HEROES- FIRST SEAS AND OTHER TALES- NOW AVAILABLE AS AUDIOBOOK!